The Heart of Lorkhan was discovered in the First Era by the Dwemer, who fashioned tools to harness its power. The Dwemer wanted to use this power to create a new god of brass, but disappeared before it could be activated. The Heart was later used by the Tribunal and Dagoth Ur to become gods themselves. Thereafter, the Heart of Lorkhan was visited annually by the Tribunal in order to renew their powers, until Dagoth Ur returned and cut off their access to the Heart Chamber. He would later attempt to create his own brass god, Akulakhan. This plan was thwarted in 3E 427 by the Nerevarine, and as a result the Heart of Lorkhan seemingly vanished from Tamriel. 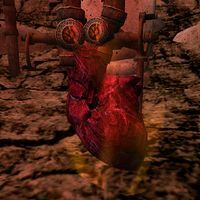 However, following the destruction of the Heart, Sotha Sil created a replication of the Heart of Lorkhan, known as the Mechanical Heart, from which his Clockwork City would draw power. 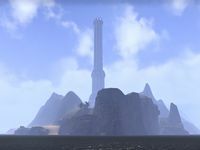 After the Mundus was created during Convention, Lorkhan was slain by Auriel and Trinimac atop Adamantine Tower; it is said Trinimac reached into Lorkhan and tore out his Heart with "more than hands". However, the Heart laughed at them and refused to die, for it was one with the new world. Instead, Auriel fastened the Heart to an arrow and shot it across the world into the sea. Ruptga, the Tall Papa of the Yokudan pantheon, created Sep out of past worldskins shed by Satakal, the First Serpent. Though Sep shared some of the hunger of Satakal, he helped Tall Papa guide the other spirits to the Far Shores where they could avoid being eaten by First Serpent. Eventually, Sep grew tired of this, gathered all the old worldskins into a ball (the Mundus), and convinced many spirits to live there. However, they eventually began to die, and found it was no longer possible to reach the Far Shores. Ruptga refused to help them, telling them they had to find new paths or live on through their children. He also punished Sep, beating him to death with a stick, whereupon his hunger (the Heart of Lorkhan) fell out. The Second Serpent was left to "slink around in a dead skin". In the Khajiiti tradition, Lorkhaj was the last of Fadomai's many children, and his Heart was filled with a Great Darkness which was given the name Namiira. Before her death, Fadomai told another child, Nirni, to bear many children. But Nirni had no place for them, so she sought Lorkhaj for advice; Lorkhaj created a place for Nirni and put her there to give birth. But due to the Great Darkness in his Heart, Lorkhaj tricked many of his other siblings into going there as well, and they became trapped. Some of Fadomai's children died to stabilize the new world, and the survivors punished Lorkhaj for his trickery by tearing out his Heart, hiding it deep within the new world, and cursing him to "walk Nirni for many phases". A more prosaic theory claims the moons, Masser and Secunda, were and are the two halves of Lorkhan's "flesh-divinity'" (his literal body). Where the other Eight Divines (here represented as plane(t)s) each gave a part of themselves to create the Mundus, Lorkhan's plane(t) was split in half; his divine spark fell to Nirn as a literal shooting star, in order to "impregnate it with the measure of its existence and a reasonable amount of selfishness." By some accounts, Kagrenac constructed Anumidium without the knowledge of the Dwemer King Dumac. The Chimer learned of it, however, and Dumac's claims of innocence when confronted by his friend Lord Nerevar sparked the War of the First Council.} The war culminated around 1E 700 with the Battle of Red Mountain; while again accounts vary widely, most agree that Nerevar, Dagoth Ur, and others made their way into the Heart Chamber beneath the Dwarven citadel. In the ensuing battle, Kagrenac (or Dagoth Ur, by Azura's instruction) used the Tools on the Heart of Lorkhan, which caused the Dwemer to immediately vanish from Nirn. Nerevar died (or was murdered) soon after, the Tribunal took possession of Kagrenac's tools, and used them to tap the Heart to fuel their apotheoses, and thereafter made an annual pilgrimage to the Heart Chamber to recharge their powers. In 2E 882, Dagoth Ur, who was believed to have died beneath Red Mountain during the battle, reawakened, along with numerous members of the Sixth House, also thought wiped out during the battle. They seized control of the Heart Chamber, and Dagoth Ur bound them all to the Heart of Lorkhan, himself included, through unknown means. The Tribunal were driven off when they made their annual pilgrimage, and henceforth could no longer renew their powers. 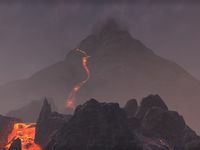 In an apparent adoption of the views and motivations of Kagrenac, Dagoth began construction of a Second Numidium, Akulakhan, to be powered by the Heart of Lorkhan. In 3E 427, two of Kagrenac's tools, Keening and Sunder, were stolen by the forces of the Sixth House. The same year, an outlander sent by Emperor Uriel Septim VII arrived in Vvardenfell, and was believed by many to be the reincarnation of Nerevar—the Nerevarine. After many trials, the Nerevarine recovered Kagrenac's stolen tools and used them to disrupt the enchantments on the Heart of Lorkhan, after which it seemingly disappeared from the world, destroying Dagoth Ur and Akulakhan in the process. A note from the College of Winterhold to Wylandriah, the Court Wizard of Riften, indicates she requested a sample of the Heart for study (the College had no such item available). The quest Discerning the Transmundane features a scholar trying to open a Dwemer Lockbox which he believes holds "the heart of a God". Another quest, Arniel's Endeavor, involves a mage trying to recreate Dwemer experiments on the Heart with a specially prepared soul gem and Keening. This page was last modified on 15 March 2019, at 21:57.